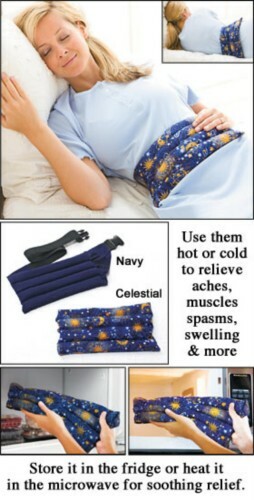 With the Hot/Cold Aromatherapy Belt, you can lay, sit or even walk around while enjoying the soothing effect of hot or cold therapy. Designed with a 52" adjustable belt, the soft 100% cotton lumbar pack (20" x 6") is filled with all-natural ingredients made from nature's finest herbs. The comfortable belt is adjustable so it can be placed on the lower back, hip, stomach or thigh to relieve pain or discomfort. Place it in the microwave for soothing moist heat that helps prevent moisture loss from the skin while providing penetrating warmth for aches, pains, menstrual cramps, muscle spasms and tension. Keep it in the freezer and use it for cold therapy to soothe injuries and help reduce swelling and bruising. Wipe with damp cloth and lay flat to dry; imported. Select from Celestial and Navy.